Caroline is an E-RYT 200 level certified yoga teacher with additional certifications in prenatal yoga and children's yoga. She holds a degree in dance and movement studies from Scripps College and is a former NCAA division III lacrosse player and lifelong athlete. Caroline is a certified wellness coach, pilates instructor and personal trainer, all through NETA. Currently Caroline instructs at the Sarkeys Fitness Center at the University of Oklahoma, teaching group fitness classes in yoga and barre, in addition to personal training. 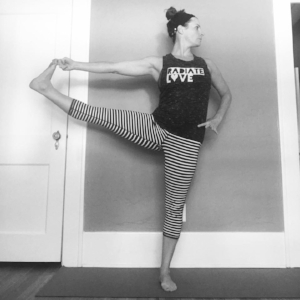 She teaches an all levels, slow flow yoga class at Climb Up Gym on Tuesday evenings and welcomes all students to this class, including pre/postnatal students and those wishing for a gentle, but still challenging yoga experience. Caroline believes wholeheartedly that fitness, yoga and wellness are not just for the skinny and bendy. Everyone deserves to feel strong and empowered and everyone can! Caroline creates classes and personal yoga and fitness sessions that are body positive and designed to make every participant get excited about fitness! Caroline is a mother to two girls, ages 4 and 6, and spends her free time rocking on her porch swing reading, taking fitness and yoga classes around town, walking her two dogs and drinking good wine, good coffee and eating good food.